Like most volunteers who view their efforts as a labor of love, GPA-WI volunteers put on thousands of miles annually to acquire greyhounds for adoption. Once placed into GPA-WI care, a veterinarian deworms each greyhound and draws blood for heartworm testing. Later, while the greyhound is under anesthesia for spaying or neutering, the vet cleans and polishes the dog’s teeth, cleans ears, thoroughly examines each greyhound and does any other medical procedures that may be necessary. Additionally, the dog is vaccinated against DHLPP and rabies. After vet procedures, the greyhound will either return to GPA-WI’s holding kennel to await the adoption date or be placed in a temporary foster home. 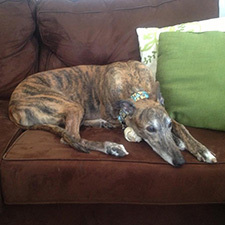 The fostering family helps a greyhound explore a home — most have never seen stairs or patio doors, recuperate from spay or neuter surgery, learn good manners, and best of all, learn that the transition to becoming a pet is journey filled with love. For more information, view the “The Greyhound — From Racing to Your Home” video.